How would you like to become a songwriter that people look up to in admiration? Would you like to be seen as one of those rare, gifted types? In a few minutes I’m going to show you exactly why it’s possible for you to be seen as a rare, talented songwriter/ musician. And it doesn’t even matter where you are now in your songwriting development. Firstly, let’s look exactly what a rare, gifted songwriter is. Once we establish this, you will see that it’s definitely NOT impossible for you to reach this status, and with the right method, it’s actually very likely. And just so you know… what I’m talking about applies to everyone. It doesn’t matter if you’re just beginning to write songs, or if you have tried desperately hard but never had any success whatsoever. Here are the three qualities that these songwriters have. 1. They are CREATIVE. This means that they continually produce ideasthat are interesting, and sound like nothing else before them. Now, I’ll get into this more later, but for now, let me tell you that creativity can be the easiest part of the songwriting process if you know how to engage it correctly. More on this later. 2. The second quality of a rare, talented songwriter is they are unique. Now this is actually related to their ability to be creative. But there’s more to it. Just know that because of their uniqueness, they develop a personal style that is different from everything else. 3. The third quality of a gifted songwriter, is they have the required SKILLS to execute their ideas. There are certain skills that are very important in the songwriting process. All of these things that gifted songwriters can do better than most people… They are simply SKILLS. And skills can be learned. I’ve touched on this before in previous articles, but today I’m going to really spell it out for you. I want to tell you the fastest possible way to build a skill that you don’t yet have. Or if you do have some skill in a certain area, how you can take yourself to world-class level very quickly. This works in every situation, and works particularly well when learning how to become an expert songwriter. Every time I need to learn something new, I use this technique to “fast track” my progress. And it works every time. Ok… here it is… the fastest possible way to develop skill in any area. When you’re learning something… anything… there is a point in the process of “most learning”. This is the point where you make the most progress… and it’s probably not when you think. When learning anything, the first step is to take in information about the topic. Ok, so after you’ve accepted some information on a certain topic, the next natural step is to take that information and USE IT in some way. This is the second step in the learning process. There are some people that say “learn by DOING”. Well, this is only partially true. This is an important step, but not where the majority of the learning happens. It’s the point where information is “fed back” to you because of the action you have taken. 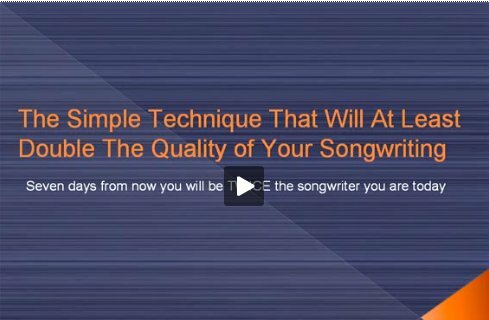 You’d follow the songwriting tips in this article. And then you’d observe what happens. And it’s observing this feedback where you will learn the most. You can GREATLY accelerate any learning you are doing by finding a way to create a large “feedback loop”. If you can act on the information in a way that sends a great deal of feedback at you, you will progress much, much faster than without this “feedback loop”. This technique has been used to turn average people into highly sensitive, professional wine tasters in just a couple of days. If you want to learn the exact procedures and songwriting tips to follow that will supercharge your progress as a songwriter, check out my book,“The Songwriting Genius Within You”.This book contains procedures that cover all the vital skills required to be seen as a truly gifted artist. It seems unfair that 99% of musicians out there struggle for years to advance less than what you can in less than a month with the “feedback” method. However if this type of fast progress can be made with much less effort and time, why not learn how to use this method? Did you know that in Classical Greece and Renaissance Europe, world class geniuses emerged at a rate of one million times the rate of today. Now with all the advanced teaching facilities and everything that we now know, isn’t this unbelievable? Well, let me tell you why this happened. In these days, students were taught by this “feedback” method. They were taught to examine the perceptions that arose within themselves, instead of being “force fed” information and expecting to absorb it. This is known as the “Socratic method” of learning… and if you read my book, “The Songwriting Genius Within You” you will learn exactly how you can apply “Socratic method” to your songwriting, and as a results you can make leaps and bounds and become a talented songwriter, regardless of your abilities at the moment. Click here now to learn more about this book. So begin thinking of ways to create “feedback loops” that can fast track your learning as a songwriter. To become a better musician, play your chosen instrument for half an hour a day, and record the session. Then listen back to this session. Do this every day you can and marvel at how your skills improve simply by creating this “feedback loop” method. To create better lyrics… write for 20 minutes without interruption. Don’t judge anything do and keep your pen moving for 20 minutes without stopping. Take a ten minute break after this and then come back and read your lyrics through twice. Do this every day for a week and you will find that by the end of the week, your lyrics will be more compelling, and flow better. There are a few more things to this “feedback” method, and you will learn more about them in future newsletter editions and in my book, “The Songwriting Genius Within You”. Remember that being a great songwriter is simply about developing the right skill set. Develop these skills and you too, can be seen as a wonderful, talented songwriter.